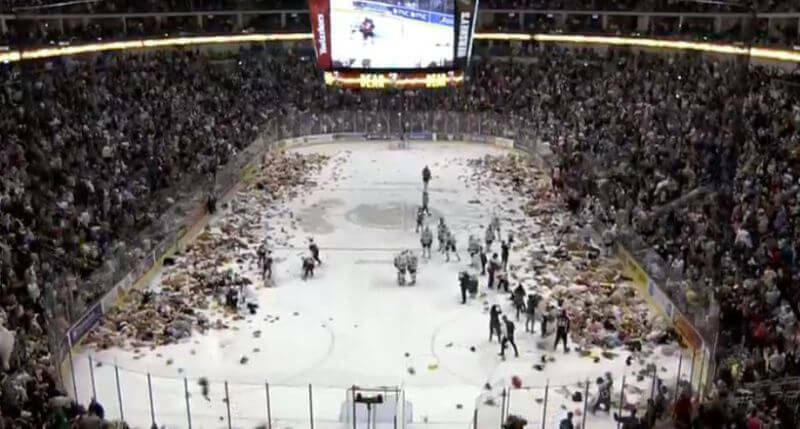 The Hershey Bears, American Hockey League affiliate of the Washington Capitals, set a new world record by collecting 34,798 stuffed animals during its annual Teddy Bear Toss. The tradition, which began 25 years ago this year, calls on fans to throw teddy bears onto the ice to be donated to local charities who distribute them to kids in need for the holiday season. Previously, the record was 28,815 bears set by the Western Hockey League’s Calgary Hitmen in 2015. The Bears made a push to break the 30,000 mark with their #Hershey30kchallenge social media campaign. They were successful, thanks to 10,046 generous fans. After a goal from the home team about halfway through the first period, the teddy bears came raining down and it was quite the sight. The collection averaged more than three bears per fan, with some fans going above and beyond and donating more than 200 bears! The toys will be donated to a variety of local causes including schools, churches, lions clubs, the American Cancer Society, and Children’s Miracle Network, but not before the players got a chance to party with them.